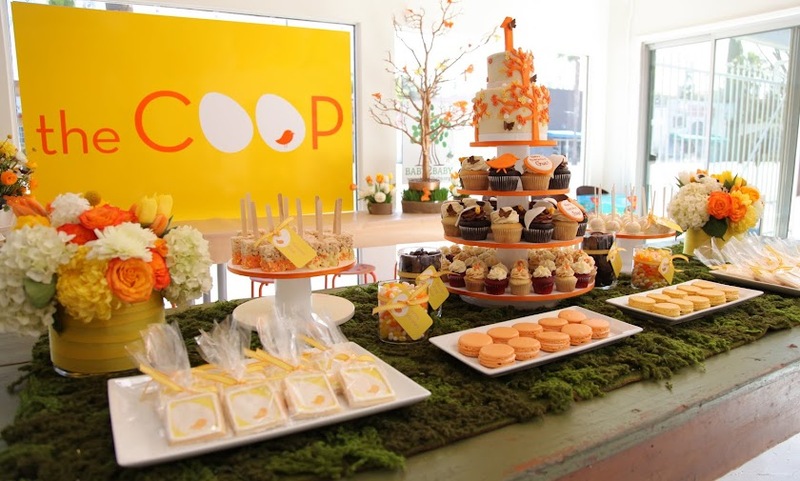 The COOP chicks are so blessed to have wonderful customers that allow us into their GORGOUS homes year after year to help them host fabulous soirees. 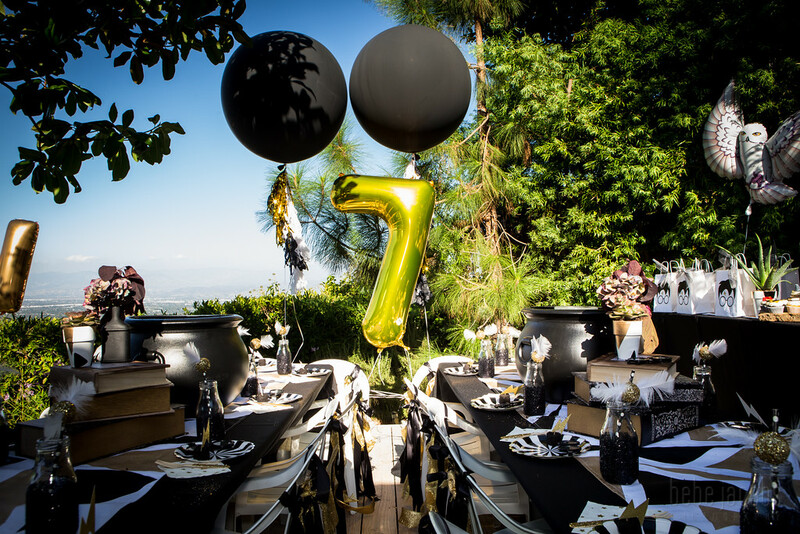 How can you not have a gorgeous party with this spectacular yard! Seriously? This is one of our favorite clients – and honestly – this space makes it pretty easy for us to bring on the gorgeous-ness! 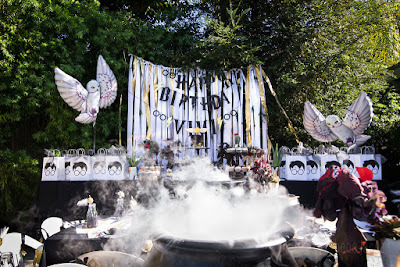 Our lovely birthday girl was turning 7… and wanted to celebrate withah HARRY POTTER party. We were thrilled to accommodate – and love how it all turned out. We went with gold, black and white as the main color scheme. I hand painted geometric table cloths – which I LOVE and we made the ribbon backdrops and chair backers – mom loves how they blow in the breeze… and we agree! 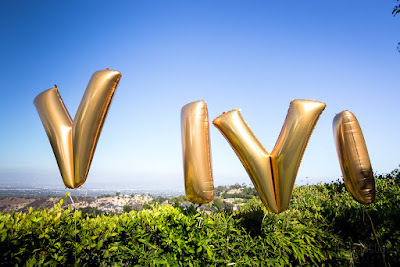 We also did the birthday girls name in big gold balloons along the hedge – which looked pretty magical. We stuck with our modern take on kids parties with the goodie bags and chose to do a very simple silhouette of Harry with a glittered (of course) birthmark. I love how they turned out. For the table – we wanted a WOW factor – we have used dry ice in drinks before and considered this as an option here – but decided we’d get more bang for our buck to use it in the cauldrons on the tables. Spooky Sorcerers brew times two! 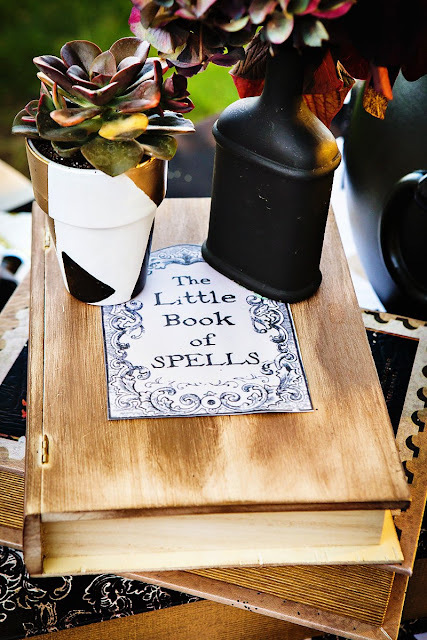 Next to each caldron was a pile of spell books that we made and some flowers and succulent plantings in pots painted to match the table runners. 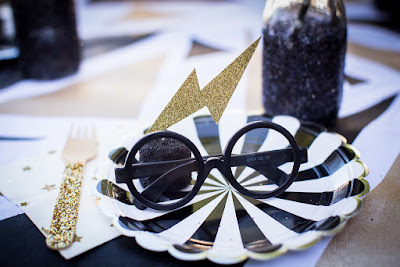 Each table setting had some Harry Potter specs with a candied black marshmallow with the potter mark lightning bolt sticking out the top. So awesome and a great 3D effect on the plate! 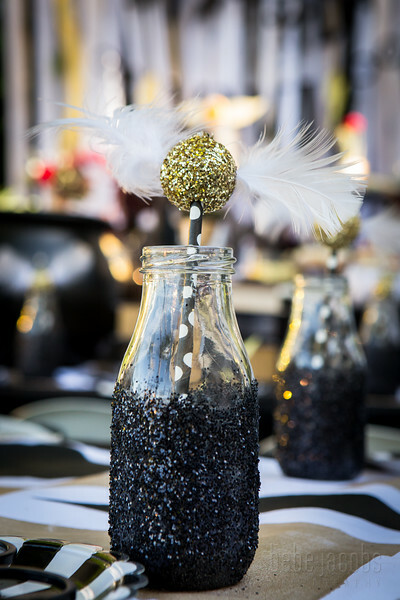 My personal favorite crafted goodie was the “Snitch Sips” – we completely covered a small stryo ball in gold glitter, stuck some feathers in either side – and voila! 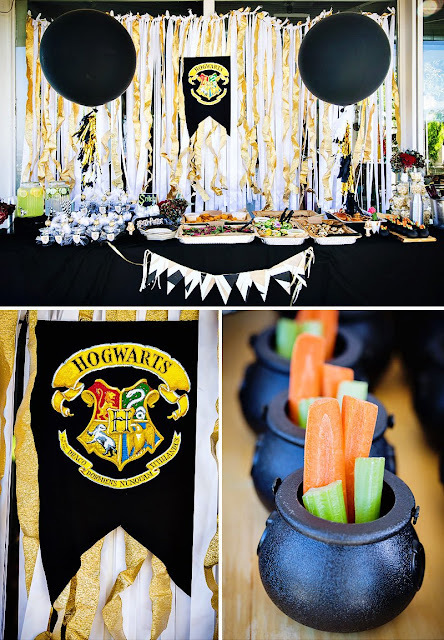 The absolute PERFECT snitch straw topper to place in the glittered bottles on the table – and on the food table in the actual drinking cups as well! At the food table the mini cauldrons filled with a dollop of ranch dressing and carrots and celery were a healthy and fun snack… to go with the fabulous food provided by Heirloom LA- which always does a beautiful job. Speaking of beautiful – the flowers were gorgeous too! 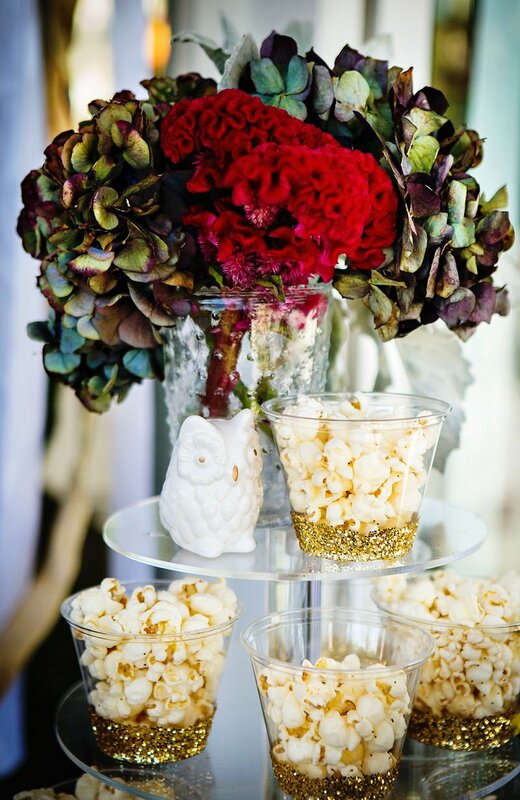 We wanted something dark and moody and were thrilled to find the dark hydrangeas and blood red coxcomb at the farmers market to complete our vision. Zebra Entertainment provided us with “Dancer” the Barn Owl and “Hootie” the Great Horned Owl and a wonderful docent who told the kids all about the gorgeous magical creatures. 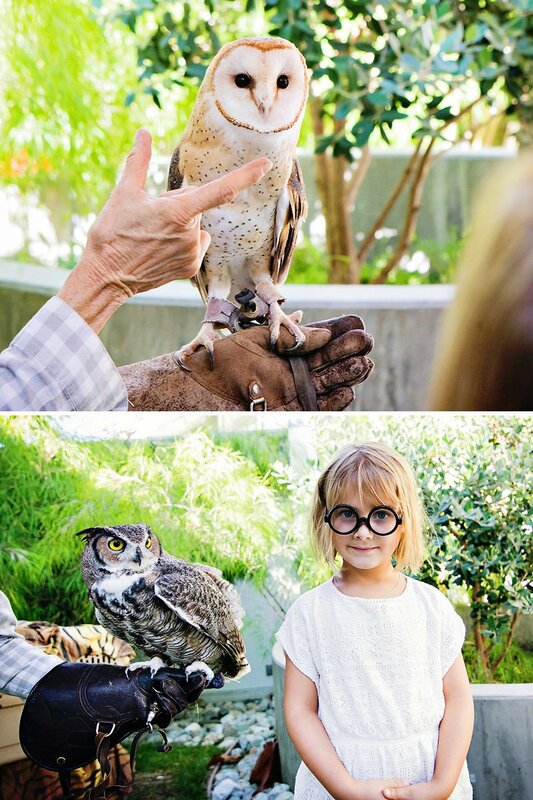 We also had an amazing spell session with Harry Potter and Draco Malfoy courtesy of Action Events. 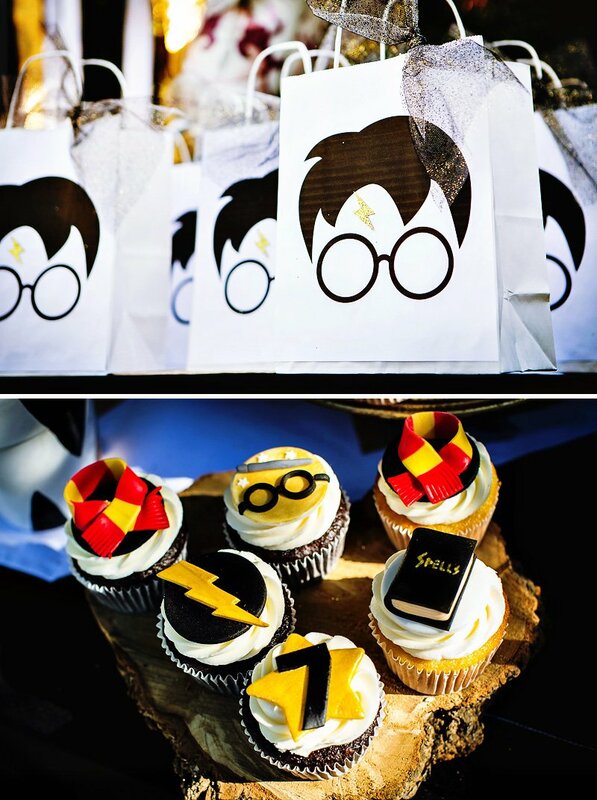 The AMAZING Snitch Cake and magical cupcakes were provided by Julie at Blue Cupcake, as always and Bebe Jacobs captured all the magic on film. It was an all around gorgeous, magical experience!